St. Mary's Church, Chard was the venue for Chard's Burns' Night Celebration, Auction of Promises and Ceilidh. 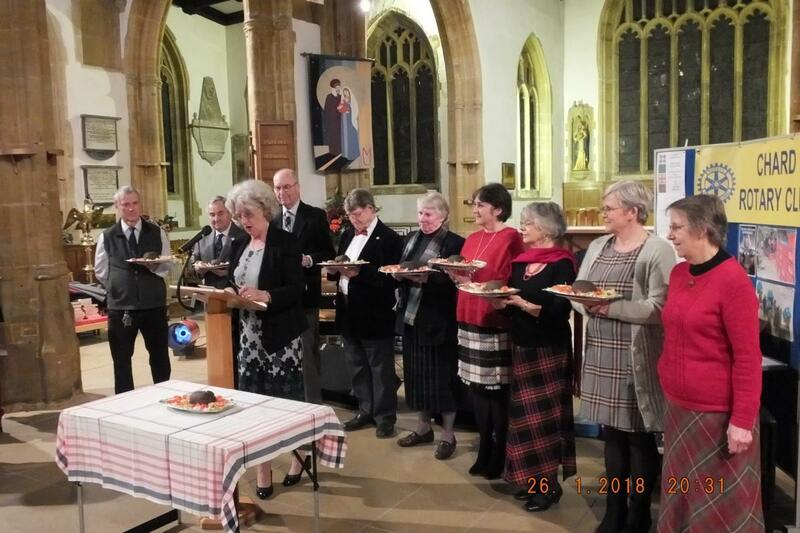 Over 70 guests watched as the haggis was paraded into the church to the sound of the bagpipes, before hearing Robert Burns "Address to the Haggis" narrated in a true Scottish acccent. The assembly sat down to a meal of Haggis, Beef Stew, Neeps Tatties and Cranachan, a traditional Scottish dessert, after which there was an Auction of Promises, many of them donated by local businesses. Chard Rotary is grateful to Jeff Day, from Lawrences of Crewkerne, who acted as auctioneer. The evening finished with country dancing to the music of Treskalion, namely Mhari Hallett and Charles Sparey, and led by caller Pip Oxenbury. We would like to thank everyone who helped make this event such a success, including many local businesses, our musicians, the people who hosted tables and the hard working team who prepared St. Mary's before the event and put iit back in order in time for Sunday's services. Because of everybody's efforts the fantastic total of £1381.00 was raised for Rotary charities, which this year include the Musgrove Park Hospital MRI Scanner Appeal.